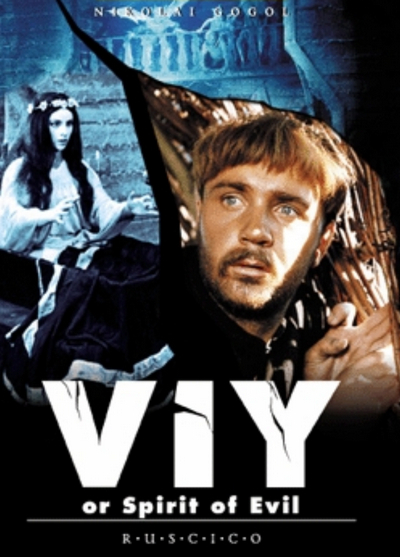 Based on a short story by the great 19th-century Russian writer Nikolai Gogol (better known for Diary of a Madman, The Government Inspector and Dead Souls) which was also the source material for Mario Bava’s legendary Black Sunday, Viy is a wonderfully vivid supernatural horror film boasting some superbly realised set-pieces and special effects. Viy tells the story of a mischievous theology student named Thomas Brutus who is called to read scripture beside the coffin of a recently deceased young woman. For three consecutive evenings, her father locks Thomas inside the rural church/barn where his daughter's coffin has been placed. Promptly at midnight, she then rises from the coffin -- for she was a witch -- and a savage battle takes place between the forces of good and evil. With chalk, Thomas marks off a circle around himself, and this keeps the evil forces from destroying him. But this doesn't stop the witch from trying her best to overpower him. Ultimately she calls forth the denizens of hell to assist her. Try again. Now should be no problem.